A professional organization in the fishing sector, the Sea Industrialists' Association (DESAD) organized a panel titled, Why is fish consumption so low in our country? DESAD Executive Board Chairman Niyazi Önen, said in his opening speech. A professional organization in the fishing sector, the Sea Industrialists' Association (DESAD) organized a panel titled, “Why is fish consumption so low in our country?” DESAD Executive Board Chairman Niyazi Önen, said in his opening speech that Turkey comes first in red and chicken meat consumption with 27 kilograms and 23 kilograms respectively. Whereas, he continued 22 kilograms is European average in seafood while Turkey's annual average is only 7 kilograms. Recalling seafood production in Turkey is sufficient and Turkey has exports worth approximately $500 million, DESAD Chairman Önen added the country failed to catch up with this success in consumption. İstanbul University's Institute of Marine Sciences Dean Meriç Albay stated Turkey is rich with the diversity of fishery products due to its geographical location. Albay said Black Sea Region comes first in consuming seafood in Turkey, Southeast Anatolia is the region with the least consumption. Albay stated that according to Food and Agricultural Organization (FAO) statistics, 168.5 million tons of seafood are produced in the world, while in Turkey 653,000 tons was produced in 2010. Agriculture and Rural Affairs Ministry Office of Fishery Coordination Manager Dr. Durali Koçak said in his closing remarks that the majority of non-vegetarian consumption will be derived from sea in the next 50 years. In the panel, it was also emphasized that Turkey needs mutual deals with other countries to improve its spot in world fishery production ranking, which is currently 45th. 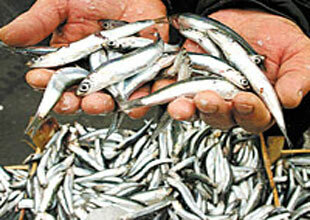 China comes first in fishery production in the world with 57.8 million tons.